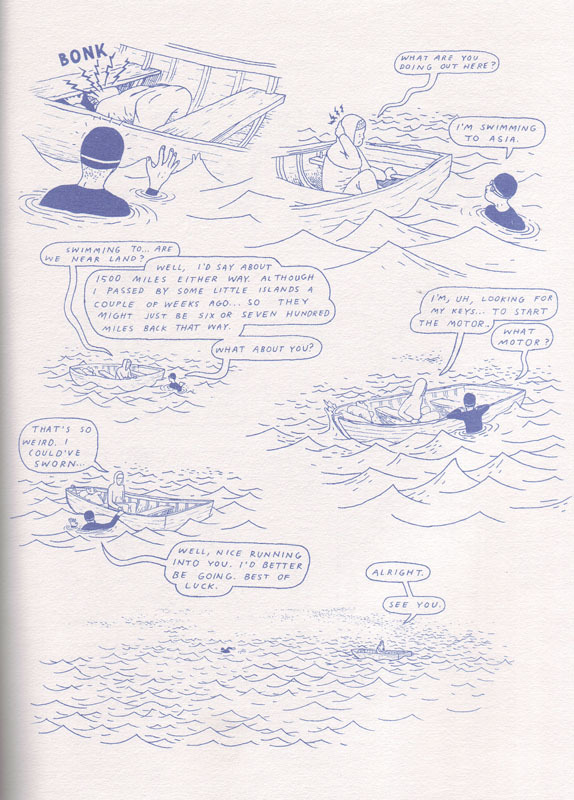 Continuing our interview with cartoonist Anders Nilsen; 1, 3, 4. A much longer process, and much more of a situation where I was thinking “What the hell am I going to do with this story?” I got to think much more about the story as a unit, than I’ve done with Big Questions, and when I go back and finish Big Questions, I’m going to be thinking more about it as a unit as well. So you don’t have a set ending for that or anything? No, I have strong images of what happens next and certain plot points, but it’s yet to be figured out. Do you have an idea of how long it’s going to be? I’m thinking about a 100 more pages, so it’ll be like 250 pages maybe [editors note, 2007: it’s currently 320 with two issues to go]. So the new book was basically what was supposed to have gone into the Showcase. What happened? Did it finally run too long? Yeah, it was too long… [Pause] I was basically supposed to do 30-40 pages and it just started getting longer and longer, and since he [Oliveros] had already solicited the book with a certain page count, it just couldn’t fit in there and still have the book make money. So it was basically supposed to appear with the Huizenga stories? So, there were supposed to be three cartoonists in there? Yeah, but it was really the best-case scenario for me, because the story itself was not ready to be seen, I’m really glad that it was not read the way it was, and then I got my own book so I’m happy [laughs]. How do you see your getting a book published like that in relation to self-publishing? I’m sort of in the middle of figuring that out. Right now, I’m thinking of self-publishing the last two or three issues – whatever it’s going to be – of Big Questions, because, well I don’t know whether there’s a good enough reason, but just because I started doing it that way. After that, it’s looking like I probably won’t self-publish much anymore, except maybe small projects. And I’m not entirely sure how I feel about that; I like the idea of self-publishing and I would like to do it, I like the degree of control I have over things that way and you don’t even have to sell the same amount of books and you make more money, but it’s a huge amount of work and it becomes a question of, do I want to be drawing or do I want to be assembling books and sending out orders and all that? So self-publishing’s not a conviction with you? Not really, I’m glad I started out that way and I think it probably – hopefully – gives me a stronger sense of what I want and how to go about getting it. Yet you seem to be very skeptical about the idea of a controlling force. Yeah, yeah, these things usually do when you start articulating them [laughter]. It feels cheap to me to deal with goodness and beauty without being aware of and confronting the other side of things. How conscious are you of your drawing style? When I started Big Questions #3, where the drawing suddenly becomes much more finished, I was thinking I would like to be able to continue drawing that way and that’s what I aspire towards. On the other hand, my philosophy is, I don’t do any penciling, because the marks I make with the pen are more direct than if I have a pencil first. If I’m trying to find a shape with a pen without already having decided where it is and what it is, I feel like the shape is more direct and more honest. And… I think that in a certain way there’s a little bit of laziness to it as well – I just want to do it and be done; like if I want to do an eighty-page story, it’s going to take the rest of my life if I try to totally work it through. On the other hand, the drawings I get really involved in and work on for three or four days, tend to be my favorites. It also seems to depend on the subject – when you draw an airplane, you pay more attention to detail. Right, yeah. I don’t know whether you’ve seen the new Blood Orange? Number 3? I just bought it, but I haven’t had the time to look through it. I have a story in there, and the story that’s coming up in the new Kramers [Ergot #5] and a lot of the stuff I’ve been doing in my sketchbooks lately, is really, really loose, almost scribbled, and I think it’s really valuable for me to be doing that and doing that quick stuff allows me to spend a little more time on the stuff I want to be finished. With Big Questions, I want fairly involved drawings that are beautiful to look at in an Old World-sort of way. Do you recognize that and do you see some kind of relation between you and your peers in that respect? Yeah, when you look at French comics you do get the sense that they actually learn how to draw, that they study anatomy and stuff, whereas here nobody knows where the muscles are, you know? And you might be right in the sense that the people coming up now, even if it’s only in the back of their minds, are sort of aware of facility – no, not facility – the lack of technical ability – no, not ability – the lack of technical interest in what they do. Yeah, if you get caught up too much in the folds of someone’s clothing, you might loose sense of where you’re going. Click here for the third installment of the interview. Inserts from Big Questions #5 & Dogs and Water twice. 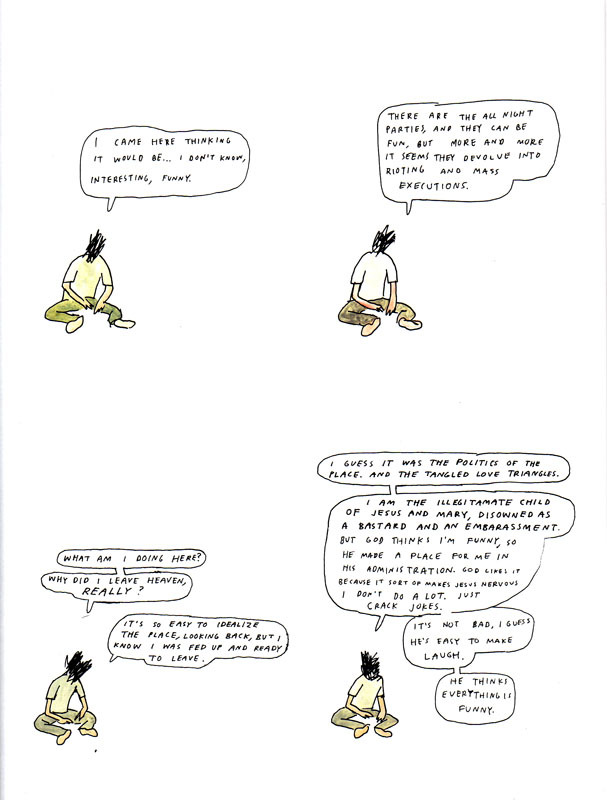 Examples from Dogs and Water, twice, from Big Questions #3 and the foldout-page in #6, as well as Nilsen’s contribution to Kramers Ergot #5 (2005).